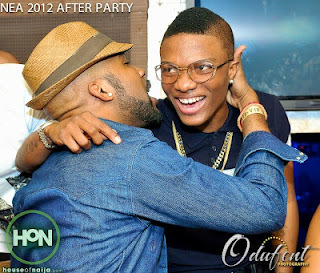 MONEY /EGO TEARS BANKY W & WIZKID APART? The news flying around lately has it that EME Boss,Banky W and Pop star Wizkid are currently at loggerheads. Sources claim the development came to be ' days back'- but is 'heavily guarded’. Though reasons for the severance of the over three years working relationship between the duo is yet unknown as the typically reclusive Ebute Meta crooner, as Banky W is popularly known has refused to make any comment, but those close to him revealed that the ongoing quarrel centres around tales of 'ego' and 'alleged disrespect'. Insiders revealed Banky’s views certain conducts of Wizkid as 'disrespectful' of his person and their 'friendship'. Further digs revealed that one of the reasons for the ongoing conflict between the two is as a result of some financial dealings that his not going down well with both parties. What further fuelled the ember of discord according to sources was that Wizkid sacked his manager, Osagie without concrete reasons despite Banky’s pleas. Close sources revealed to us that Wizkid is planning to float his own record label once his contract with E.M.E records owned by Banky W expires. In the wake of the story, people were skeptical owing to the fact that Banky W nurtured Wizkid to this level where he is gradually climbing the ladder of success. Sources claimed those in the know are forced to keep off and quietly watch the gulf of differences widen between them by the day. However,an insider,of Banky’s Record Label E.M.E,debunked the tale in a phone chat with us, and stated clearly that the story was farther from truth. We shall keep you posted as events unfolds.